Sometimes you can develop pimples on the neck that may even spread to nearby areas like the scalp, jawline, back, chin and chest. 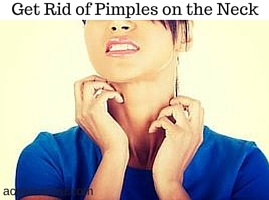 Read on to learn about the causes of neck acne and how to get rid of neck pimples. Although most people get acne on their face, it’s also common for adolescents and adults to have pimples on their neck and jawline as well as under the chin. These are all grouped together as neck acne, but they are in no way similar to each other. Neck acne can almost always be recognized by pimples on neck, chin, and jaw areas of both males and females. Men are usually more susceptible to pimples under the chin and neck, but this doesn’t mean that women cannot experience the same symptoms. There are a lot of potential causes for pimples on the neck, and many separate treatments. Depending on the location of the pimples as well as the type of pimples on neck, chin, or jaw areas, treatments can vary significantly. There is no one size fits all treatment for neck acne, but there are effective ways to combat each type of neck pimple. This list mostly excludes the normal causes of general acne such as hormones or clogged pores, focusing more on the unique causes of neck acne. Skin on the back of the neck is more similar to skin on the back and all over the body rather than facial skin, therefore the causes and treatments are different than those of traditional facial acne. If your question is “how do I treat the pimples on the back of my neck?” this section should give you some good insights. Excessive hair oil transfer from the scalp or dandruff flakes may cause neck acne. Rubbing your neck with your hands, straps for bags, or clothing that rubs the neck can irritate the skin and cause a breakout. Hair care products such as shampoos, conditioners, or hair styling products can cause pimples to appear on the neck. If surfaces such as pillow cases, couch pillows, or anything else that contacts the back of the neck frequently are dirty, they can transfer dirt to the neck and cause acne. If oily hair or dandruff is the cause of your acne, a new hair washing routine can solve the problem. If it is your hair care products, you can try new brands and new styling products to see if that will help. Pillow cases should be washed once per week and other surfaces should be regularly cleaned to avoid the spread of excess oil and dirt. Your neck is made of sturdier skin than your face. Because of this, it may respond well to products like these that can help cleanse the skin and open up pores. More often than not, these types of pimples have more to do with irritated skin than anything else, although that is not the only cause. If you have pimples on the front of your neck or under your chin, this information can help you cure them. Irritations like jewelry, scratchy clothes, or some perfumes can cause breakouts under the chin and on the neck. Men who shave their face and neck area can cause pimples if their razors or aftershave products are irritating the skin. If your razor or aftershave is causing your pimples, try a different type of razor and a new aftershave. Do not wear jewelry that is tight around the neck or rubs awkwardly at the neckline, try to avoid rubbing your neck with your hands, and do not wear clothing which is causes itchiness on your neck. These pimples are most common for men, as most men shave their chins and jaw lines frequently. There are some reasons that women might get these pimples as well. Poor quality razors or some aftershave products can cause acne on the neck and jaw line. Tall clothing that wraps around the neck or reaches the chin area can cause skin irritation. A simple change of razor or aftershave might get rid of your acne and prevent further cases. Clothes that cover the neck are not recommended for anyone who suffers from neck acne and should be avoided whenever possible. If necessary to wear these types of clothes, look for very soft, cotton clothes that will not irritate the skin. Pimples from hairs being in-grown might appear on the jaw line, the back of the neck hairline, or under the chin. They are not like normal pimples and should be treated differently. Do NOT attempt to pop, lance, or otherwise break these pimples as you might with normal white or blackheads. They can become infected more easily and will not respond well to this sort of treatment. In-grown hairs can sometimes be the cause of cystic pimples. For more information on how to treat cystic pimples, check out WebMD’s page here. Shaving against the hair growth can create in-grown hairs. Razors that are too dull might cause in-grown hairs. Those with curly hair experience more in-grown hairs than those with straight hairs. If you grow more hair than other people, because of more hormones or any other reason, you could experience in-grown hairs. This treatment can help to uncover the hairs from your skin by removing the top layer of skin that the hair is trapped underneath. In-grown hairs will be freed and the pimples caused by them will go away. If possible, relax from shaving your face and neck for some time to allow the skin to heal fully. This can get rid of the pimples on your neck. Always follow the natural growth of the hair when shaving; never shave against the natural direction of growth. Changing your razor type or blade as well as the aftershave you use can help. Also, you can try using warm water when you shave. A popular brand of tretinoin topical treatment available on prescription. This is a benzoyl peroxide formula used mainly in the treatment of acne. Inova 4/1 contains benzoyl peroxide as a main ingredient, but it also has salicylic acid that has a similar effect on acne. Neck acne generally shows up in the form of pimples on neck areas. Each area has different causes, so make sure to pay attention to where your acne is and treat it accordingly. Remember that the back of the neck has thicker skin than the front of the neck or the skin under the chin, with treatments varying to account for this difference.